Alright my loves, it's time to get this thing rocking! The first day of The Mane Objective's 10K | 1M Giveaway is under way! 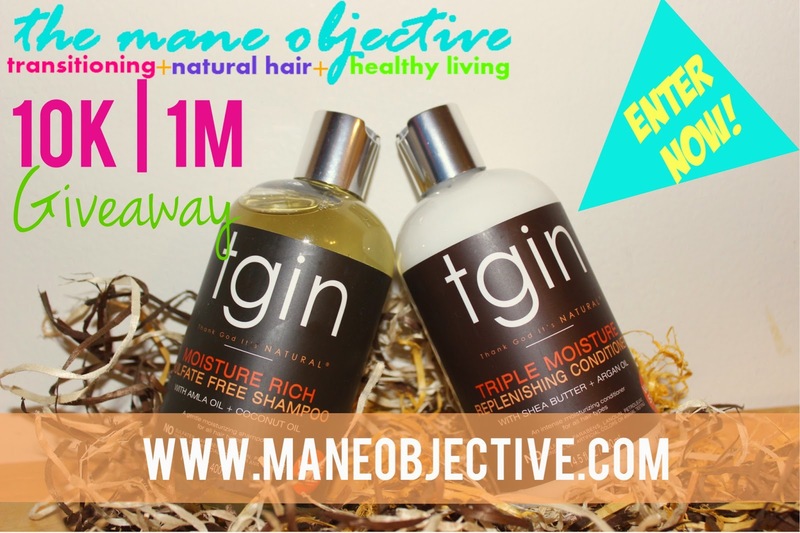 Today's Prize: TGIN (Thank God I'm Natural) Moisture Rich Sulfate-Free Shampoo x Triple Moisture Replenishing Conditioner FULL SIZE duo! 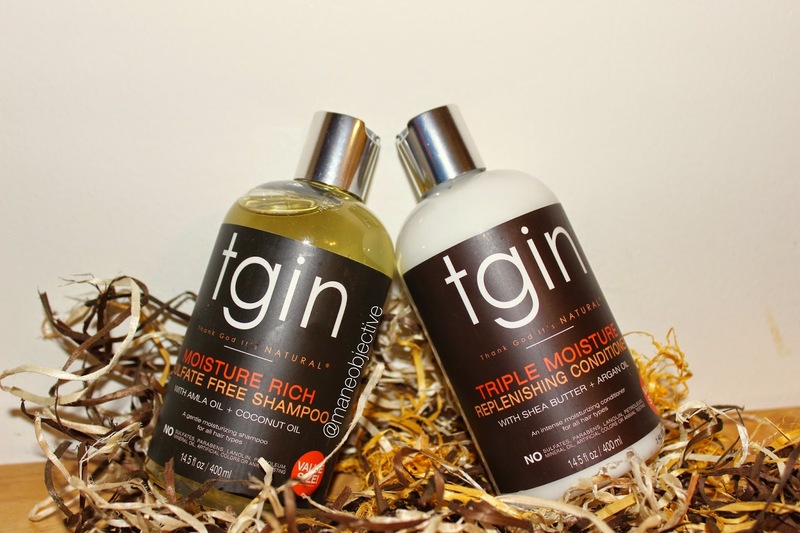 Because you guys have been rocking with me for so long, you know how much I love TGIN's shampoo and conditioner. Now it's your turn to partake in the goodness! Two lucky ladies (or gentlemen? Do I have any male readers, lol?) will win a duo of shampoo and conditioner each. 1. Comment on THIS POST (YES, THE ONE YOU'RE READING RIGHT NOW) with 2 things you'd like to know more about -- that I can address in a future article or video. 2. Post your entry by Friday, January 16th at 11:59PM PST. 3. That's it -- you're entered! To improve your odds of winning, you can submit up to 3 separate comments. However, each comment must contain two DIFFERENT ideas. Duplicate comments/ideas from the same person will not be counted. Both winners will be randomly selected by randomization provided by random.org. Contest begins at 12:00AM on January 16th, 2015 and ends at 11:59pm on January 16th, 2015. All times are Pacific Standard Time (PST). All entries posted after the cutoff time will not be considered. I would like to know if you have ever or would ever use coconut milk on your hair as a wash-out conditioner, leave-in conditioner, or a simple deep conditioner? I've used it once but would like to know more about the effects on hair as coconut anything is phenomenal. Also, when trimming curls yourself, what is the best technique? I've always just snipped the ends whenever they look frazzled out....but are there any techniques to make the cut/trim make the curls look more even? 1. Is it true that one should simply condition and not shampoo? 2. How often should I shampoo my hair? Or should I stick to simply using a Co-wash and conditioner ? How effective does clay wash clean your scalp? 1. How can i trim natural hair myself without using heat? 2. How to install crotchet braids!!!! 1. How do you know your hair is getting enough moisture? 2. Is your hair really protected under protective styles? 1. What are your favorite sealants to use during cooler months? 2. If you suffer or have suffered from single strand knots, how do yoh rid them/ minimize them? 1.How often should you use a protein deel conditioner? Is it necessary to follow up with a moisturizing deep conditioner? 2. Someone with type 4 hair should they do the LOC or the LCO method? 1. What are some of your favorite products to combat dryness? 2. Is it necessary to have a different regimen depending on the seasons? 1. How can I maintain moisture with color treated hair? 2. What. Aural products are beat to preserve the color in your hair? I really just want to know how to use curl formers lol. Also how to maintain moisture in the winter because whatever I'm doing is NOT working! I would like to know your favorite homemade DC recipe? What would be your top tips for a new natural? Your favorite protective style as a transitioner vs now? I would like to know how to clip your own hair? I would also like to know natural hair tips for kids and styles for them too. 1.The best oils for sealing your ends. 2. Your must haves for haircare during a trip (to the beach). What are the best products to cleanse and moisturizer your face. Also, how can I protec my hair from the sun? 1. How to minimize SSK (single strand knots) and 2. How to effectively moisturize high porosity hair. Thanks! What is the best detangler you've ever used? What's your absolute favorite deep conditioning product? How do you sleep with a wet wash and go? How do you minimize single strand knots with wash n go? Breakage vs. hair shedding....protecting hair in frigidly cold weather. 1. Best styling product for clumping curls w/o crunch and 2. "Safe" at-home hair color that won't damage natural hair. Thanks! 1. Current hair regimen and 2. How to effectively length check your own hair. Thanks! 1) what is your regimen for the winter months to retain moisture? 2) tips for maintaining color while transitioning? 1) how to refresh your wash and go or twist out during those awkward in between stages of length? 2) where do you get any of your hair accessories? (I'm a newbie naturalista) What are the best products to reduce frizz, define my curls (3b and c) but maintain softness? I've seen people last their wash and go for days at a time by just refreshing with water and no sealant. How do you have a wash day so efficient that a refresher is all you need throughout the week? Highlights vs color - which is better for long term care and moisture/length retention? #1. I'm always up for tips on retaining moisture because my dry hair needs help. #2. Any tips on how to prevent or combat split ends would help me alot. Hi I am 4 months natural and I wanted to know how do you get your hair to retain moisture? How do you take care of your hair if and when you have color? What are some different ways to rock a TWA? What is the regimen you use? What advice would you give to somsone who is considering going natural? What made you create a blog? #1.Tips on products that work but are affordable for naturals on a budget. #2. Tips on how to find a professional stylist who can handle (and nurture) your natural hair. #1. Good winter protective styles #2. Tips on strengthening fine hair. 1. Pros/cons of coloring natural hair....and 2. Best daily moisturizers for dry scalps. How often should I clip my ends. Should it be cut wet or dry!? Thank you! 1. Good protective styles for twa and 2. Good moisturizers for type 4 hair textures. 1. How do I combat frizz? 2. How do I keep my twist out longer for one day? #1: how to get & keep natural hair shiny? #2: how to tell if my hair is actually dry or if it's just the texture I'm feeling? #1: tips for accomplishing a wash 'n' go without a diffuser? #2: how to preserve on shoulder length hair? #1: retaining length without protective styling? #2: how often should I use henna to see the shine, thickness & tint? I am new to being a natural & I color my hair (red). I've heard all kinds of comments about coloring and going natural. My hair is really healthy right now. It would be helpful to see more positive and constructive tips on coloring and being a naturalist. What's the difference between wash and go hair and wash an wear hair? How to effective apply product to hair without missing sections. I would like to know if you have any experience with oil rinsing and using Apple cider vinegar. Do you believe in the practice of trimming your hair on certain days of the month? What's one of your best stylers? Have you ever done tea rinses? How often do you use protein? I would like to know how to handle dry itchy scalp. I also wanna know wats the best way to keep your hair moisturize I'm in the mountains and its very cold up here. Quick styles for my preteen. Any advice for a new naturalist. 1. I have a baby sister and I really DO NOT want my mother and grandmother putting all the chemicals into her hair that they put in mine but I really am tired of having the same argument with them. How can I show them the benefits of protecting her natural hair? I've started to buy natural products for them to use on her but I am not always around to make sure they are used. 2. I recently did a mini chop and my hair is much curlier but I still have some heat damage in the middle of my hair. How can I fix this without cutting again? 1. I'm interested in learning more about mud washes, particularly how DIY mud washes compare to the "store" bought washes. Because I'm DIY deficient. 2. I think you may have done a video on this, but your favorite drug store products. 1. Since you've talked about how the water in the glass porosity test is ineffective, I'd like to know more about how to tell your porosity level. 1. How often should I henna before i start to see the reddish tint you've had in some of your pictures? 2. favorite styles besides a wash and go? 1. What vitamins, if any, do you suggest for hair health and growth? 2. What are some of the best deep conditioning methods you use? 1. I'm 3 years natural in May (go me!) and plan on getting my hair dyed a copper sombre (soft ombre) since it's not so harsh of a color change. I know it's a pretty common way to dye hair now, so I figure this would apply to many people, too. What practices can I do pre- and post-salon visit to keep my hair damage to a minimum? 2. My mother has gone from skepticism to praise as she watched my hair flourish since I went natural. She'll make small comments about wanting to change her hair (which will go though cycles of growth and severe breakage), but I think strict Army regulations on hairstyles in uniform and years of doing her hair the same way are keeping her stuck. Are there any ways you think that I could help her maintain healthier hair? 1. I'd like you to talk about how to deal with hair breakage and how to stop the hair from falling every time I touch my hair. 1. What is a good way to preserve an twist out on transitioning hair. I tried the pinapple methos but it stretches the curls out too much. 2. I was thinking of getting a cellophane and wanted to know what I should do to ensure my hair does not get damaged. 1. Can you discuss how to transition. Like when to cut, how to nurture the damaged hair, how to decipher between what's damaged and what's not and how to shape your hair in all of that. 2. Can you discuss how to purchase products. How to store products and how to tell if something is working or not. 1. Are all sulfates the same? Are they an enemy or frenemy? 2. Is daily hair manipulation too much if you are trying to grow your hair and have length retention? Is it better to do more protective styles? 1. Can you use henna too much? So much that it leads to breakage? I wanted more input on this matter since I am doing my second henna application this weekend (4 weeks). The breakage comes in because my new growth hair curl pattern is tighter than the part where henna has been applied. 2. I would like 30 days of 'bomb' natural styles. For most of my journey I have done the 2 strand twist but I really would like to jazz things up and am looking for some 'hairspiration' :) That would be an awesome challenge. Do you have any go to styles that are really cute that you could share? I have 4c hair. 1. I really enjoy reading your blog! Seriously! I would really like to start my own to help those naturals in need as well. Do you have any pointers about how to begin? 2. This is a issue near and dear to my heart: My daughter has hair very similar to yours and she does not want to wear it down because she does not like the frizz factor. Her hair is gorgeous and rather easy to maintain but I am lost! Please help! I grew up using grease and butters. She needs more gel and silicone for those fun curly styles. Do you have any pointers? Thanks! 1. What are good ways to care for color treated hair and to prevent breakage? 1. How can you cut down the time of henna, I would love to try but the amount of time deters me. 2. How can I retain length without doing "protective styles"
1. Is your straightening process still the same or have to cut out some products? 2. What the best way to straighten natural hair? 1. How to achieve consistent and a longer lasting wash and go. 2. What combination of hair products do you use to achieve longer lasting wash and go. Do you have a fabulous natural hair stylist that has helped you take care of your natural hair like none other? Please share your experience on how the relationship began! 1. How often is "too often" in regards to shampooing after completely transitioning? 2. Can twists/boxbraids really be considered protective styles for all hair types? 1. What is your experience with natural hair coloring and if any what products do you recommend to color or bleach hair. 1. The use of ayurveda treatments in hair care. 2) How to maintain moisture in hair during winter months..
(1) How to car for an itchy scalp. (2) How to do flat twists. 1. How to take care of protein sensitive hair. 2. How to maintain a moisture and protein balance to eliminate breakage. 1. I would like to know if any product with water as the first ingredient can be used a leave in. For example could I use Shea Moisture's Curl Enhancing Smoothie as a leave in because water is the first ingredient or would it not work in the same way a leave in conditioner would? 2.I would like to learn more about henna. P.s. Have you tried the henna from Lush? 1. I would like to learn more about single strand knots and whether or not the knot will get worse if I don't cut it out. 2. I would also like to know how to address a dry scalp but my hair feels moisturized. If my scalp feels dry how to i moisturize it without overwhelming my hair/without the greasy feeling? 1. Hot oil treatments on transitioning hair. How often should I do them? 2. Wash day: Is it better to leave hair in twists/braids and wash that way or wash each section untwisted/unbraided? 1. How often should you shampoo your hair versus co-washing while transitioning? 2. What's the best protective style to eliminate frizz from sweating while working out? 1. Did you add any oils/conditioners or teas to your henna treatments? 2. Did you use henna when you were transitioning? 1. Protective styling(best ways to protect your ends. 1. What products to use that will prevent my "wash and go" from getting stiff... But stay bouncy. 2. How to do some natural styles that are legal (corporate) world friendly. What do you think about treating heat damaged hair with a dark beer hair rinse? Do you think brushing your hair especially in a ponytail can affect your curl pattern? 1. Can you discuss cnaps as they are/were called? I really want to know more about transitioning. Do you think it's different or harder to transition from texlaxed or heat damage than from relaxed hair ? Also, i would like to know how much of a budget you have for products ? 2. Protecting natural hair when swimming. I have this problem every summer, and I have no idea what is best to do with my hair so it gets the most protection possible from the chlorine. 1. How did you get your curls to bounce back after dying it? 2. How to manage and bring out the best in the different textures one might have. 1. How to protect you hair from sun damage. 2. What products are best for treating heat damage hair while transitioning? 1. What hair styles you recommend that can work for any length? 2. What is the best way to trim your hair in its natural curly state? How to tame your roots when doing a wash and go. How to take care of dyed hair. What are the signs that you should trim your ends ? And how do you know your scalp is completely clean when shampooing/co washing? 1. Did you do a big chop or did you transition? 2. What styles did you do when your hair was way shorter.... How did you rock you hair? 1.DO you think that there is too much emphasis put on curl definition in the natural hair community? When worn in it's completely natural state without any holding or defining products, not everyone's hair curls, but is it healthier to have the curls clump, and is there any shame in just rocking' the undefined fro?? 2. Why do natural hair salons cost so much more money than a regular salon even for things such as perms, weaves, color, or a simple wash and go style? Congratulations Monique!!! You're winner #1 -- e-mail me at info@maneobjective.com so I can get your shipping information! Thank you for entering! Tasha, congratulations! You're winner #2 -- please e-mail me at info@maneobjective.com with your shipping information. Thank you for entering! Hi Diahann! You've been selected as the other TGIN winner! Please email me at info@maneobjective.com with your shipping information! Congratulations!!!! I was wondering how long it takes to receive these winning, I've emailed twice already but no response. Is it ok to sleep in a hair mask overnight? If so, what brand would you suggest?